is it possible for 2 separate parts to share a parameter? That the value of the parameter could be changed in either part & would be updated in the other. Working with Creo 2. 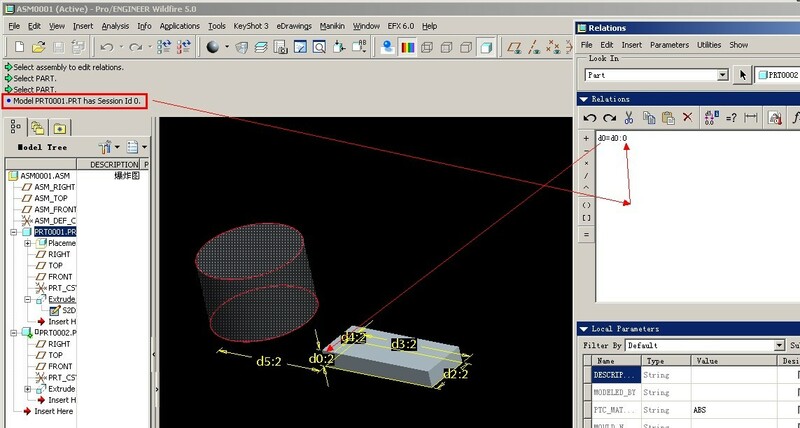 I would want to achieve this using standard Creo functionality if possible. I understand it is like sharing a value of same cell in other file in Excel where we have the option to give the path of the file and cell. I dont know it is possible or not, but I appreciate it's a nice idea. All the other options for sharing paramter like making common assembly or using internet explorer i guess you already know. Yes it is possible using a feature called a notebook. When you start a new part notebook is on the the options. You create a parameter in the notebook and assign a value. You then have to declare the different parts to the notebook that you want to use the parameter. The parameters that you have setup in the notebook are then available in each of the parts that have been declared to the notebook. The value is then changed in the notebook and the changes are reflected in the parts. You may also have to use a relation to link dimensions etc to the parameter in the notebook. I can see how to do this if both parts are used in the same assembly at some level using the top down design references. For further clarification...the declaration muct be done from the part. The parameters in the notebook are then available to choose from in all parts that are declared to the notebook. Looks like you don't have a lisence for Notebook. This is what use to be a Layout. both parts are used in the same assembly, perhaps you could explain. It would appear that NOTEBOOK is the old LAYOUT, either way, its an option not open to me, as i don't have a licence. Top down design means you start with the assembly and your parts can reference features from each other. 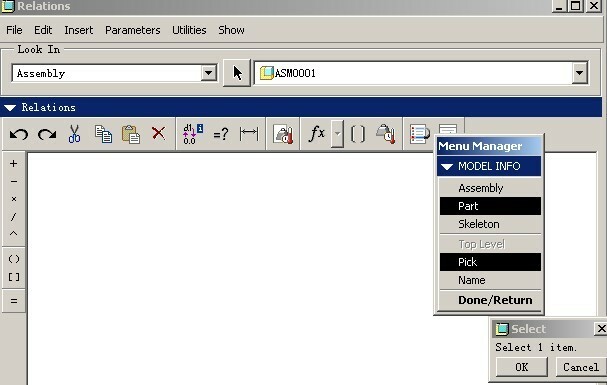 From the assembly level, you can make relations that use parameters from other parts. This is one of the powers that Pro/E has had from the beginning but it also has pitfalls. I am ceretain that things like notebook and layout draw from this power but now that it is an extention product, old school works well. The main thing to remember is that parts now become dependent on the assembly being loaded for certain operations. Often, this becomes an enterprise decision as to whether employees use this concept or not. Breaking the links after the fact can be a significant effort, as I remember it. When you do this, you will start to realize what is happening in the background. I remember an example model helicopter of this functionality. Anyone know where to find that link? Thank you for your reply Antonius, i understand the concept of top down design, i am already doing all that you describe in your reply, copying geometry from one part to another, the use of relations to control features in multiple parts, all of it. What i was asking you for, was an explaination of how 2 parts can have a common parameter, you said "i could see a way, if both parts were in the same assembly", well they are. What i want to know is how to add a common parameter to 2 parts. I just re-read all the posts & Jayanta seems to be suggesting this can be done if you have a common assembly, well i do, so that's the question, how do you do it?